Machine safety in the production of automotive parts is critical to maintaining a productive and safe environment. With body assembly, integrators, and powertrain manufacturing, the safety needs may differ depending on the type of production, but all personnel must be protected, especially with the implementation of robot welding cells or turntable applications. Installing a proper safety system can be complicated and take time with the wiring, mounting/alignment, and software configuration. In addition, it can be hard to find a system that provides adequate diagnostics and troubleshooting and that doesn’t have nuisance tripping when small objects fall through the protective field. 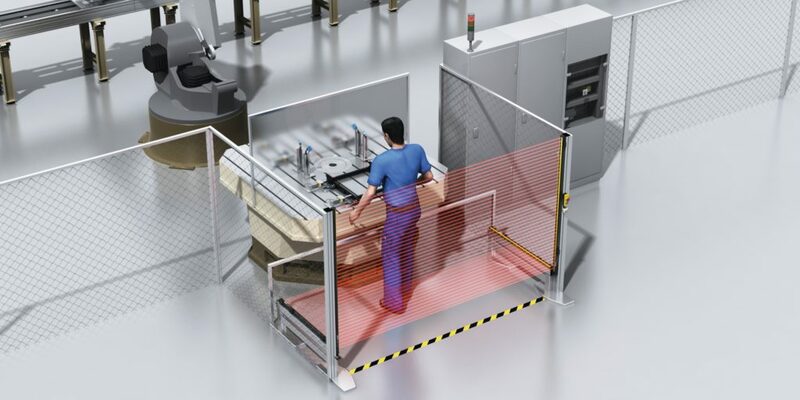 Safety light curtains can provide a distinct advantage to automotive part suppliers looking to maximize productivity and safety. Easy installation/commissioning: deTec4 makes installation/commissioning simple with eight multi-colored LEDs for alignment status, protective field status LEDs along the length of the device, and an integrated visible alignment aid. You’ll minimize setup or replacement time with IO-Link beam data, offering the most extensive support on the market. Lastly, with DIP switch configuration, all functionality is configured without software, which saves you time and money on software licensing costs, training, and the need for a computer on site. Comprehensive Diagnostic/Troubleshooting Capabilities: IO-Link offers you the flexibility you need to fully integrate safety and automation into one device, minimizing initial setup and commissioning costs. You’ll also be able access necessary data remotely via any device to eliminate the need to be on the floor. Consistent Presence Detection: With smart presence detection, the deTec4 enables guest units to be in sleep mode until the host is infringed. This means you’ll be able to eliminate nuisance tripping incidents. In addition, the reduced resolution features enables you to ignore smaller objects, like weld slag that is ejected through the curtain. Less interruptions means maximum productivity. Low Power Consumption: You can eliminate the need to have a separate junction box in the field to supply power to the sender unit, saving you money on the cost of material and labor to make the junction box functional. With the use of a T-Connector, the deTec4 sender and receiver are both able to be powered using one port on a remote IO block, which maximizes component costs by saving other expensive safety remote IO connection points for other safety devices. The deTec4 safety light curtains offers a complete package on safety and convenience. You’ll be able to maximize production of automotive parts and increase the protection of your personnel.